Bernie Schaeffer: The Schaeffer’s Edge? Bernie Schaeffer uses a combination of fundamental, technical and sentiment analysis to make judgments about future stock market direction. Mr. Schaeffer is a prolific market commentator, but his archive at SchaeffersResearch.com extends back only a few months. Coverage of his forecasts in the business media has some large gaps. His predictions for 2002-2007 yearly closes of the Dow Jones Industrial Average, as reported by Business Week, are off by a fairly large 16% average (see chart below). Bernie Schaeffer’s forecast sample is moderate, as is therefore confidence in the measurement of his accuracy. In his MarketWatch.com column of 12/23/07, Peter Brimelow records that “Bernie Schaeffer’s Option Advisor” is among the ten worst performing newsletter portfolios for 2007, down 18.4% through 11/30/07. In his MarketWatch.com column of 12/13/02, Peter Brimelow records that “Bernie Schaeffer’s Option Advisor” is the 5th best performing newsletter portfolio over the previous 12 months. 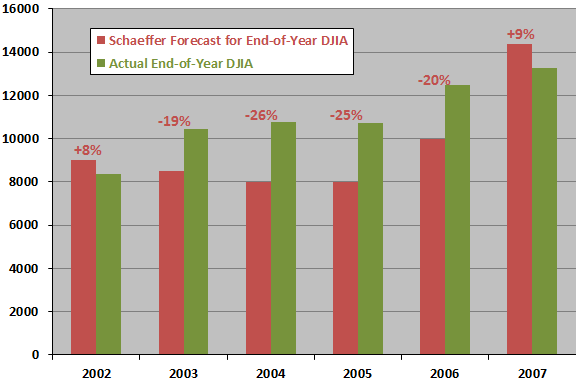 The following chart summarizes the accuracy of Bernie Schaeffer’s Business Week forecasts for yearly 2002-2007 closes of the Dow Jones Industrial Average. His forecasts are substantially too low for each of 2003-2006 and moderately too high for 2002 and 2007. In fact, he has the worst stock market forecasting record of any of the experts in Business Week’s annual survey.